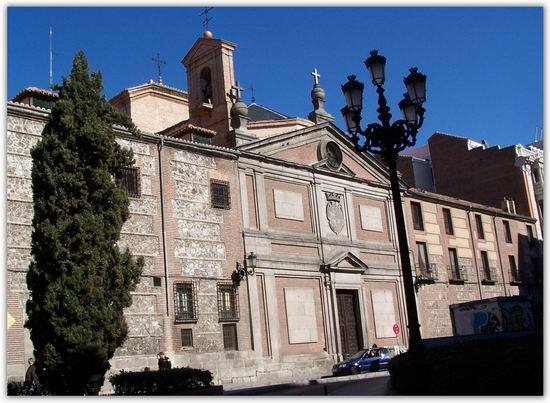 In the centre of Madrid, in the Plaza de las Descalzas square and within a short stride of the Gran Via and the Puerta del Sol square lies the enigmatic Monasterio de las Descalzas Reales (literally, the Monastery of the Barefoot Royals), a Franciscan convent also known as El Monasterio de Nuestra Señora la Consolación de Madrid. The 16th century buildings are situated within the former palace of Carlos I and Isabel of Portugal, and were founded as a convent in 1557 by their daughter Juana. A large number of noblewomen took the veil in the convent, often seeking refuge from unpleasant marriages, and brought with them copious dowries which built up a wealth of art treasures and holy relics for the convent in the 16th and 17th centuries. It became one of the richest convents in Europe. The convent boasts an impressive collection of art and relics. Amongst its attractions are an array of marble sculptures, and works by Tiziano, Sánchez Coello and Luini. Tiziano's Caesar's Money is a particularly valuable part of the collection. The Flemish Hall contains works by Hans de Beken and Breughel the Elder, and the convent's tapestries were based on drawings by Rubens. The Spanish Renaissance composer Tomás Luis de Victoria worked at the convent from 1587 until his death in 1611. The convent's collection of reliquaries, the legacy of hundreds of years of dowries, are said to contain pieces of the True Cross and some of the bones of St. Sebastian. Despite the wealth contained within their buildings, however, the Franciscan Sisters had taken a vow of poverty, and were forbidden to auction any of their treasures or to spend any money raised from dowries. By the mid 20th century they were living in starving conditions amongst a sea of art treasures. Fortunately, the state intervened when it realised the conditions the Sisters were living in, and they were granted special dispensation from the Pope to open the convent to the public as a museum in 1960. It is open daily, except Mondays, and guided tours are provided in Spanish. The buildings provide a haven of tranquillity amongst the noise and bustle of Madrid, and its worth as a museum was recognised in 1985 when it became the European Council's Museum of the Year. The convent still houses a number of Franciscan nuns, living in an enclosed order as solitaries and devoting their lives to prayer, contemplation and the tending of their vegetable garden. The cloister is well known as the site of processions during Holy Week, especially on Good Friday, where the event is accompanied by music from the era when the convent was founded. To get to the Monasterio, take a city bus number 3, 25, 39 or 148, or take the metro to Opera, lines 2 and 5. It is located just round the corner from El Corte Inglés, close to Calle Arenal and within walking distance of both Puerta del Sol and the Plaza Callao.